Our Grant Writer, Veronica, joined the Development department at Second Chance in January 2018 and took a moment to reflect on her time learning about the impact of our Adult Programs. I’ve always liked the word REDUX. It’s one of those rarely seen words that makes you sit up and take notice. In Latin, redux (from the verb reducere, meaning "to lead back") can mean "brought back" or "bringing back." I don’t think I ever really thought deeply about the significance of the word until I joined the team at Second Chance. For some reason, the word kept popping up in my mind at odd times – sometimes walking down the hallway at our facility at the Joan and Irwin Jacobs Training Center, or in the midst of a conversation with one of our Job Readiness Training participants, or people enrolled in our Reentry Court program. Redux seemed like a thread that wove its way through each of their lives. The notion of coming back, or being brought back, is one which embodies the spirit of the many people who come through the doors of Second Chance. People whose lives – for whatever reason – took a wrong turn and veered off into some other unplanned direction. 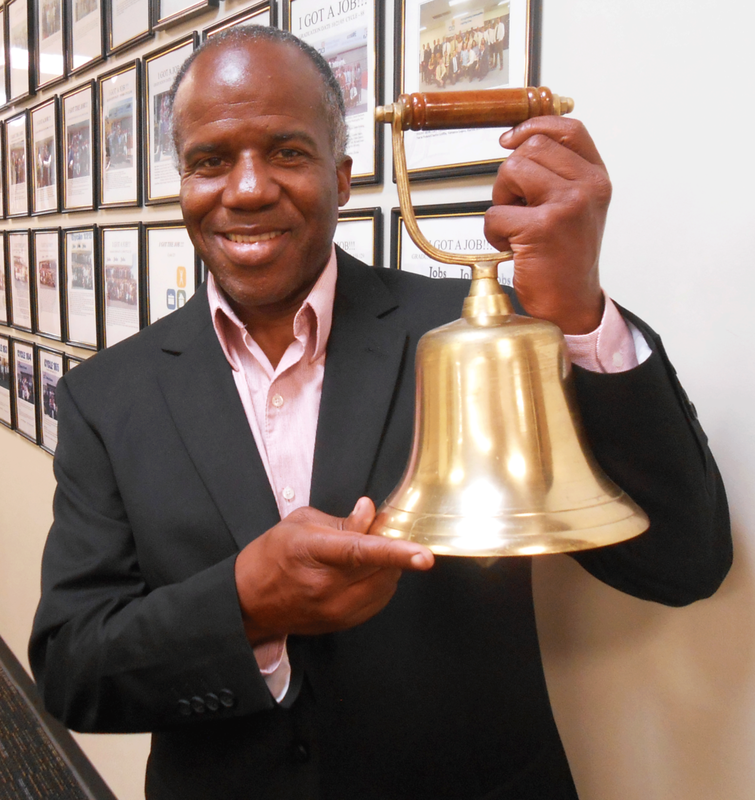 A newly employed Job Readiness Training graduate with the famous bell. It is evident in their faces, full of hope that this new road will lead to a better place, hope that they can finally leave their past behind. It is evident in the thoughts and insights they share with fellow classmates, or returning graduates who are there to share their journey back from wherever that wrong turn took them. And it is evident in the joyful ringing of the large Captain’s bell in our lobby – a rite of passage for graduates who have succeeded in overcoming their challenges and finding work: a stepping stone to independence and self-sufficiency. Each time the bell rings, loud and clarion clear, it is a cause for celebration: not only for the successful job seeker, but the many Second Chance participants who are on their own journeys toward a fresh new start, their own redemptive road to Redux.